Lithium Australia looks like it might be onto something at its Medcalf prospect in WA, with recent field investigations unearthing multiple outcrops of spodumene-bearing pegmatite dykes and anomalous soil geochemistry suggesting possible extensions of the mineralisation beneath the surface. 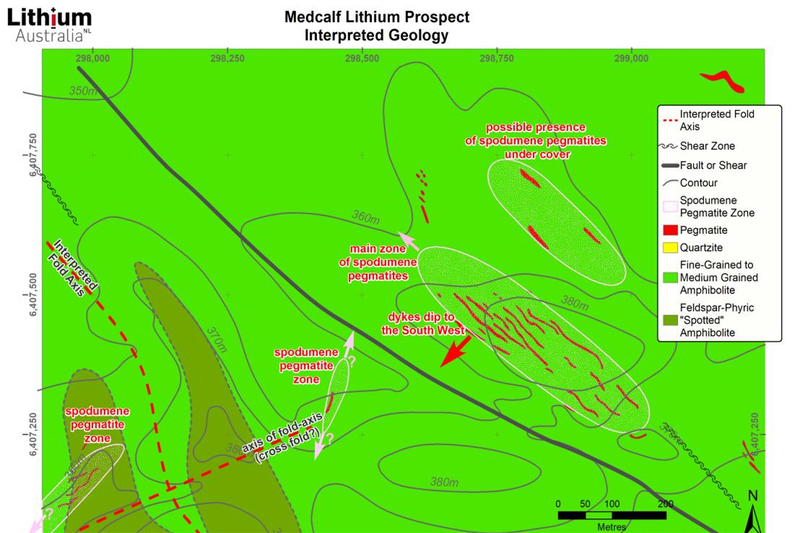 Medcalf is located with the company’s large, prospective Lake Johnston project, west of Norseman in WA, which is an under-explored greenstone belt within the wider Yilgarn Craton that hosts the world-class Earl Grey, Mt Marion and Mt Cattlin spodumene-bearing lithium pegmatite deposits. According to company management, the Medcalf area has similar geological features to those major deposits and also to Lithium Australia’s own historical Mt Day lithium prospect, some 50km to the northwest. The new fieldwork reveals that outcrop of the spodumene-rich pegmatites at Medcalf is at least 450m long and the swarm extends over a combined width of 100m trending in a northwest-southeast direction. The swarm consists of at least 20 individual pegmatite dykes, which range up to 5m thick and dip to the southwest. Assays from rock chipping last May produced results up to 7.15% lithium oxide from spodumene-dominant samples, with similar results up to 5.13% lithium oxide and elevated levels of the pathfinder elements tantalum, caesium and rubidium, returned during the current sampling program. Importantly, lithium soil geochemical anomalies are located beyond the current outcrop limits, hinting at further prospectivity for the sought-after mineralisation in the general region at Medcalf. The company said that based on current field evaluation it had estimated a conceptual Exploration Target of between 5 million tonnes and 8 million tonnes grading between 0.8% lithium oxide and 1.2% lithium oxide for Medcalf at this stage. The Medcalf pegmatite deposits represent walk-up drilling targets and Lithium Australia is proposing to drill a fence of RC drill holes across the main outcrop area of the spodumene-rich pegmatites in the December quarter of 2019.